De Primi Fine Art in Lugano is pleased to announce its new exhibition Takesada Matsutani, open from 16 November 2018 to 25 January 2019. In 1963, in his early twenties, Takesada Matsutani (Osaka, 1937) became part of the Gutai group: the Japanese artistic movement which, starting in the early 1950s until 1972 (the year of its dissolution), has collected the main creators of the Far East. Matsutani, following the example of the tarashikomi (an archaic Japanese technique) and of Jackson Pollock’s dripping, from the beginning of his career, has played with both concepts of time and space. The slowness of vinyl glue drips modelling sensual curvatures, the rhythmic time of a fortuitous and accurate drip. The space of large sheets or canvases welcoming festive backgrounds, sometimes three-dimensional – inflated by the breath with a straw – sometimes patiently decorated with the fine and thick warp of the graphite. Towards the end of the ’60s, Matsutani moved to Paris, where he still resides. Since then he has multiplied variegated drips of colour, of different materials, elaborating them with brushes, brooms, spatulas, balloons and bags, in a careful ceremony where the East meets the West. 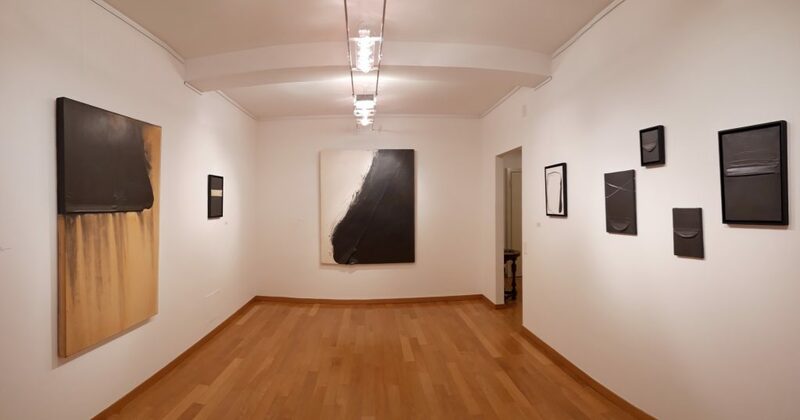 This exhibition gathers about twenty works realized between 1974 and 2010: creations on canvas and on paper, revealing the inimitable technique of the artist. The thick and dense black of graphite, patiently laid by the accurate gesture of the hand; the Zen sign of the pen, circumscribing the wealth of emptiness as a pause, a silence, a breath; the compact colours of acrylic through minimal timbre variations; the sinuous and graceful shapes of coloured vinyl glue, embroidering variegated surfaces. Almost all in black and white, the essential colours of the ancient Japanese tradition: the symbolic shades of Ying and Yang, of the plus and the minus, of the positive and the negative, of this and that, united in a peaceful cohesion by the Taoist thought. Going through his points of contact, signs, gestures, circles and waves, the observer perceives an extraordinary synthesis between fullness and emptiness, motion and stasis. In this sense, as an ancient sage, Matsutani seems to say: “Festina lente” (Suetonius, Vite dei Cesari, Augusto, 25, 4), hasten slowly, in the will to rediscover the rituality, the concentration and the depth of being and doing. In his artworks, the reflection, the meditation and the oriental ceremony oppose the speed, the impatience and the western fury. The hybris (excess, vanity, pride) of our archaic Greek origins is purified in a slow and profound contemplation.